These are the C-Scow Fleet's perpetual trophies. In addition to these, the top three boats in both the Saturday and Sunday Series receive a trophy denoting their placement. Donated in his memory by the Kaeding and Storm families in 1996, this trophy is a wall-mounted clock and weather station. It is to be awarded to the 6th place Sunday Series skipper. A gift to the club by an anonymous donor, this elegant silver champagne bucket was first presented in 1989 to the winner of the All-Illinois C Championship Regatta sailed on Long Lake. In 2009, it was re-commissioned and awarded to the top boat in the combined Saturday and Sunday Series. This perpetual trophy, donated in 1960, is awarded to the crew of the high point trophy award. Martin O. Hjortland, Arthur W. Hill, Leo Ottosen, and Al Hovey four early LLYC judges. Donated this perpetual trophy. The award is made to the skipper having the highest total points for the Saturday and Sunday series races, but since the low point scoring system was adopted, it has been awarded to the skipper with the lowest point total, not including throwouts. The Fisher family donated this trophy in 1948 in memory of Mark Fisher, a popular songwriter and bandleader and father of LLYC co-founder Bill Fisher. 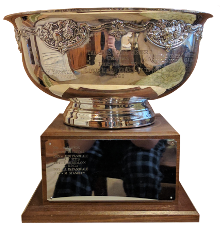 The trophy is a silver champagne bucket as was originally awarded annually to the winner of the Pistakee-Long Lake Regatta, and later to the winner of the Tri-Lake Regatta. Re-commissioned in 2009, it is to be awarded to the top boat in the Sunday Series. Les and Gen Neumann donated this ornate silver tray in 1955. It was originally awarded to the top visiting skipper at the Powers Lake-Long Lake Regatta, then later to the top Long Lake skipper at the Tri-Lake Regatta. Re-commissioned in 2009, it is to be awarded to the top boat in the Saturday Series. This trophy was originally won in a championship powerboat race on the McHenry River in 1928 by Walter Marggraf grandfather of LLYC member Nancy Schroeder. He owned and raced his Garwood speedboat with an Hispanic Airplane Engine on Long Lake and the River. This oldest trophy was later donated to the newly formed Long Lake Yacht Club by Walter and Rose Marggraf in 1947 as a perpetual trophy. The trophy is a silver pitcher and is awarded to the winner of the Fourth of July two race series. This perpetual trophy has been awarded since 1953 to the winner of the special Labor Day series. Wilbur L. Kercher donated this in 1960 for a perpetual award to the annual Stay-At-Home series. This trophy is awarded to the skipper that bothers to get off the couch on one of the very rare weekends that club standings aren't counted. A perpetual trophy donated by Jack and Tony Adolf in 1965, for post season racing. In 1968 it was awarded to most improved skipper. Beginning in 1971 it bacame an award for a Saturday series race. This sailboat relief designed by Roland Richards was donated by Emilie Nauman mother of LLYC member Emilie Woods and her children in 1977 as a perpetual trophy. It is awarded to the winner of the Saturday Race closest to Mrs. Nauman’s birthday, July 1. This is a perpetual trophy donated in 1979 by Carol Jones and Tom Cooper in memory of their father. It is awarded to the winner of a Saturday race close to July 21, Jim Cooper’s birthday. This trophy was donated in the memory of Kenneth C. Bonde in 1972 by his family. It consists of a round silver tray and four champagne glasses and is awarded annually to the winner of a Saturday race. This was donated by Harry Larson and Bill Klee great grandfather of LLYC members RJ and Andrew Ringa, two of the original yacht club judges whose unselfish services to the club will never be forgotten. Originally the trophy was awarded to the skipper on the basis of good sportsmanship; presently it is awarded to the winner of the first Saturday race of the year. The trophy is a cup and has been awarded since 1947. This perpetual trophy is a silver tray donated by Carl and Paul Janensch in 1952 to commemorate the wedding anniversary of their parents, Mr. and Mrs. Ernst Janensch. The award is made to the winner of the Sunday race nearest the wedding anniversary of the Janensches, July 10. This was donated by the Long Lake Boat Co. in 1956 and is awarded to the winner of the last Sunday race of the season. This is an original painting by Dave Becker. It was donated in 2011 by the Madden family in memory of George and Viola Madden. It is to be awarded to the winner of the last Sunday race in August. This perpetual trophy is a square silver tray and was donated by the Sabatini family in 1969. It is awarded to the winner of a Sunday race. 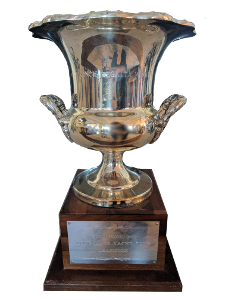 This perpetual trophy was donated by Mrs. Vesely in 1956 and is awarded to the winner of a sunday race selected by the sailing committee. It is a silver revere bowl. The Wigginton Trophy was donated in 1985 by Norm and Suzi Reese in memory of Wes and Eileen Wigginton. It is an original metal wall hanging. It is to be sailed on a designated Sunday. This was donated by Bradford J. Willett, M.D., and his wife Charlotte, as a perpetual trophy in 1955. It is a champagne bucket and is awarded to the winner of the first Sunday race of the season. These awards, consisting of three cups and donated by Bill Byers in 1957, are presented to the first three boats of a designated Sunday race. The originals were replaced in 1971 with revere bowls. Donated in his memory by his family in 1995, this trophy was originally awarded to the winner of the Friday Night series. Re-purposed since the cancellation of the Friday series, it is now awarded on a designated Sunday race. Irwin and Howard Buchholz donated this in 1959 as a perpetual trophy of a designated race. The trophy is a large salad bowl, hand made of native Hawaiian wood. A champagne bucket donated by James Cooper father of LLYC member Tom Cooper to promote frostbite sailing on Long Lake. This perpetual trophy, donated by Craig Neumann, is awarded to the winner of a special crew’s race. The trophy is a standing wooden plaque. This handsome pedestaled round silver tray was donated to the National C Scow Sailing Association by the Long Lake Yacht Club in 1991. It is awarded to the winner of a selected race at the National Championship. This is gift of the Pistakee Yacht Club has been awarded annually to the top Pistakee skipper in the Tri-Lake Regatta. The award has been made since 1948 and is a silver cup. Originally donated by Art Stamm of LLYC member Evie Cooper in 1954 for the winner of the Powers Lake Regatta, it was replaced with a wooden ship’s wheel by his family and awarded to the top Powers Lake boat at the Tri-Lake Regatta. It has since been retired.